So when the LOVEFEST Doodle Do challenge came up today, I sort of cringed…I am not a doodler! 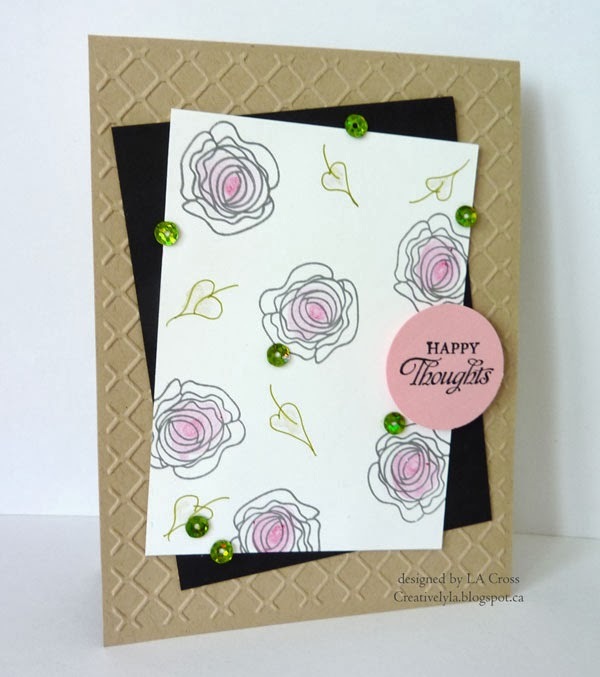 I stamped the rose image repeatedly on a piece of white card stock. Then I used an Inktense pencil and my water brush to casually color a bit of each flower. Next I used a marker to doodle the leaves. The flowers and the leaves are both “kissed” with some Wink of Stella marker. The card base was dry embossed and then I layered some black card stock between it and the stamped and colored piece. A simple stamped sentiment circle (say that three times fast! ), some sequins and done! Your title caught my eye immediately. I had to smile as I am not a doodler, either. Wish I could do that better. It rather scares me. 🙂 Your card is so pretty and I really like your roses with just a bit of color on them. The leaves look great. Lee-Anne, I love your painted roses and doodled leaves!! A really pretty card with a great message!! I am doodler….unfortunately it looks like a grade schooler did it.. Your doodled leaves are fantastic as are those pretty roses! Have a wonderful day!